Back to the main arc. It's never too late! Believe!!! The emotion and dialogue here is so moving. We see the love and devotion both Twilight and Spike hold for one another. It's such a magnificent, heartfelt scene. Excellent job keeping the real scenes from the show in the gems, even while they're scattered along the floor like that. Spike's silhouette in the sixth panel may be my favorite. The way those tears form, outlining his eyes perfectly, is excellent. When this comic concludes, I really wanna see a dub of this! it’s so good! Everypony makes mistakes. But Sombra is a big boy, and he can take all the blame just fine on his own. 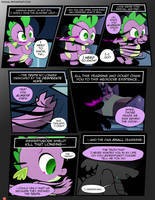 I don't see why Spike ever doubted Twilight caring about him. Did the 70± pages of the story not explain it? I do get he was confused about what exactly his relationship should be but that Twilight cares about him never seemed to be in doubt. It is more rather he could consider him her son. However even if she does not consider herself his mother that doesn't mean she doesn't care about him. Yet this is exactly what Sombra did with Spike. He took his doubts regarding his relationship with Twilight,slowly changed the narration and made Spike believe she didn't care. Having a direct access to Spike's mind and manipulating his dragon greed was why he (almost) succeeded. Yes! The level wins for once! Uh oh... and why the hell not!!? WHAT DOES HE MEAN IT'S TOO LATE??!! I think if this was an actual mlp episode twilight would sing something about love and how it's never too late "amending fences"
Is it just me, or does Spike look younger in the second-to-last pannel? I love this panel. Twilight's face on the third frame is so sincere and loving and worried. This is exactly why I love Twilight and Spike. Sorry that I don't have more to say other then there's something about this dialog and these emotions that is just tear jerking. I'm very excited to see how it all ends. Spike, do we really have to do this? : Ah, yes... I was wondering what would break first... Your spirit, or your body? Had a good feeling for most of this page, but that last panel... Good feeling gone. Yes, you can, Spike. Don't underestimate Twilight Sparkle. She will hold back death for you if necessary. "I'm not crying because I'm sad, but because I'm happy to see you smile before saying goodbye "
I wonder what Spike is talking about. I would like a happy ending but sometimes you can not have one of those. Awesome page dSana, as always. Uh oh... Three words you never want to hear in a dramatic story. I have a feeling that I know what Spike is talking about. He, that is, Sombra controlling him, made Spike eat the Crystal Heart so there is nothing to protect the Empire from the arctic climate. That’s what Sombra meant before and Spike believes the only way to save the Crystal Empire and everyone in it is with another dragon heart as a replacement. And the only one available to use is... his. Will they find another way or will this be Spike’s final, courageous act in saving the Crystal Empire? You can be right with that theory,樂we'll see when the next page comes! I feel like at this point, you've more than earned the title "The Cliffhanger Queen." So now I have two royal titles, the first one was the Queen of Cuddles. : The Queen of Cuddles?!?! YOU CAN'T CUT OFF THE PICTURE THERE! What.....what does he mean by that? This is epic!! And so sad!! And I want more!! even if his body is permanently grown she still want's him back home.